Morning run on the road from Longyearbyen to the airport last July. This is the "Bear boundary" beyond which one should not go without a weapon, just in case. 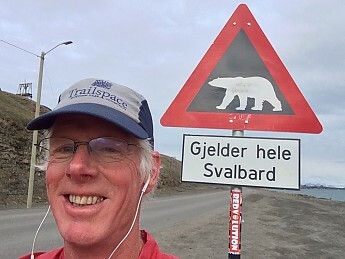 The sign says "Applies to all of Svalbard". Cool, you have been on Svalbard! Im waiting for the more extensive tour report. Love the place! Mostly research work in and around Longyearbyen, but we managed to get in a few day hikes so maybe I can put together a short TR. All forums: Older: Climbing Elders, Who Remembers Chuck Roast? 200 Weight Woolly Fleece Zippered T Newer: Fleece jacket vs Waterproof jacket?